One man skip business best service best price. Travel across Auckland, give me a ring 0274747161­. Central Auckland including parts of the North shore, West, Rodney area including West coast beach areas. Bins are four days hire rates which allow us to drop bins off on Friday and pick up on Monday. Or drop off on Monday pick up Thursday. If this doesn't work for you please call me to make other arrangements. Our pricing and service will beat most others. I include GST etc, no hidden costs unless your bin goes over weight. Stuart provided/delivered excellent hasslefree service, just a ph. call away and very obliging. Lovely to deal with and collected Bin promptly (even tho was Sunday) I was also happy and pleasantly surprised at the cost. Happy to use again and Highly recommend to all. Thank you so much. Stuart is a dream to deal with. He was so understanding about the renovation and gave me a fantastic price and let me keep the bin a little longer. He understood my situation and when I asked him for another bin he managed to deliver it the next day. 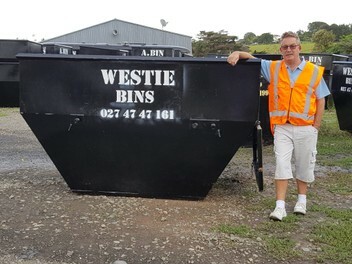 Brilliant service and I surely recommend A Bin to everyone. Thanks Stuart ???? a awesome coy to deal with. ordering and delivering of the bin was easy and on time. fantastic communication throughout the process. highly recommended trader. many thanks.